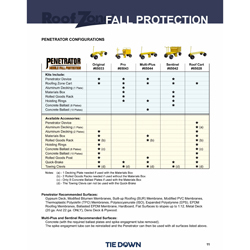 Created by Roof Zone, Penetrator Mobile Fall Protection devices are the lightest mobile fall protection systems available. When a fall occurs, this machine will engage and pierce your roof, creating a secure anchor system. The Penetrator is designed for 3 fall arrests and 2 fall restraints, or a total of 5 workers at one given time. Also available from Roof Zone is the Penetrator 2+2 system which offers 2 fall arrests and 2 fall restraints, or total of 4 workers. The maximum arresting force should not exceed 1,800 lbs. and the free-fall height should be no more than 6 feet. Other options available are the Penetrator Pro, Penetrator Sentinel, and Penetrator Multi-Plus. These devices can penetrate a wide variety of surfaces and can be reused after being engaged.